Cool mediterranean annual that we love for its complex combination of bract and flower colors. To 14″ tall the nodding bell shaped flowers are blue with a white ring around the lip. The base of these flowers is yellow. Large bracts protect the flowers and turn from blue green to shades of indigo as they mature. A cool season annual that often self sows. These seedlings cruise through winter without much of a hitch and are up and blooming by mid spring. By the heat of july they quickly die setting profuse seed and disappearing. Light additional water besides rainfall will lengthen the show. Seedlings appear where they are happy- this can even be the cracks in the sidewalk. Seedlings are easy to spot and move or dispatch if unwanted. Nice in spring containers. 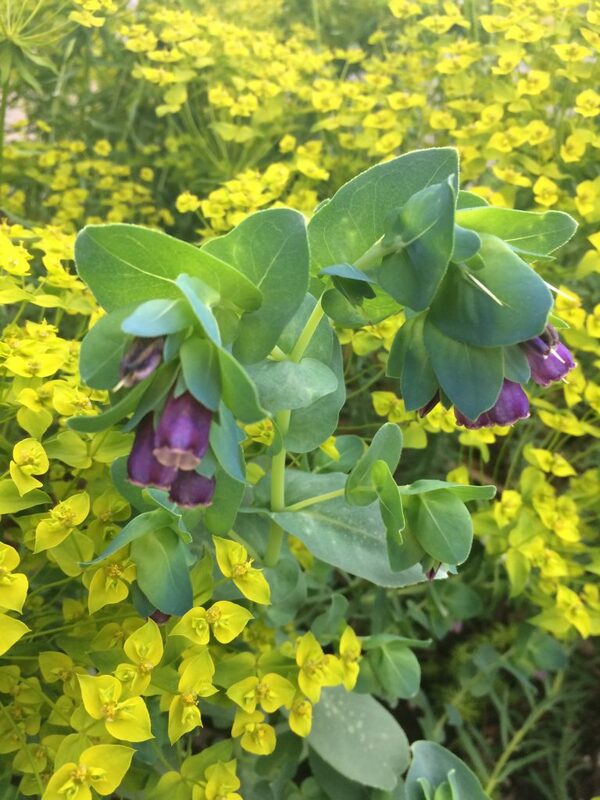 Plant with early blooming Euphorbias for a real picture of yellow and blue contrast.